A healthy lifestyle and regular exercise is the key to long life. Exercises, in particular, are a great way to stay fit, lose excess fat and help fight against anti-aging and age-related diseases. According to medical experts, living a physically active life has many positive influences on your body. Today’s post explores the exercises that’ll make you live longer and enjoy life after 50. This is an ancient Chinese exercise that works on the different parts of your body to improve agility and flexibility. It’s not just a body exercise but it also taps into your mental wellbeing by lowering stress levels and improving mental strength. Through regular qigong practice, you can reduce the risk of depression, high blood pressure, and acute pains. And that’s not all. Qigong can enhance your immune system, give you stronger muscles, and help you attain better body balance. Since this exercise involves joint movements, it can help reduce joint pains, inflammation and improve your general wellbeing. Bend over slowly, but not all the way. Hold your position without bending the knees and look straight up. Now, try to reach the floor with your hands. You should start feeling your waist muscles stretching. Hold this position for 10 seconds then stand up straight again. Repeat these steps 5 times taking care not to overdo it. If you’re just beginning, start gradually until you adapt. During this exercise, you will feel muscle stimulation and it should be a comfortable exercise. This exercise improves blood circulation and helps to keep your muscles active. Scientists have discovered that cycling can slow down the aging process and keep your muscles at their optimal level. Aging takes a toll on your muscles and it explains why many old people complain about physical pain. It turns out cycling can reverse these negative effects and improve muscle strength as well as your immune system. The thymus is the part that produces white blood cells. 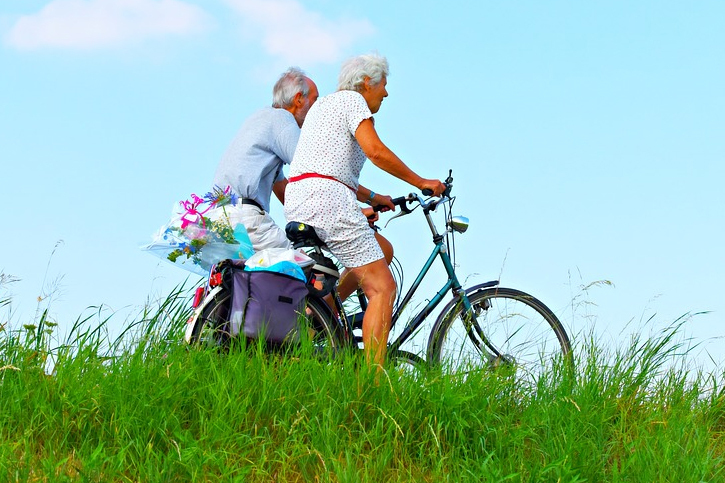 In one study to see how physical activity, specifically cycling, affected white blood cells, a group of over 100 cyclists aged over 55 years was examined. Results showed that blood samples from the group that actively engaged in cycling had white blood cells which were active and acting like those of 20-30 years. Research by the Indiana University Bloomington’s Councilman Center discovered that swimmers who engaged in light or intensive swimming had a significant delay in age-related conditions such as loss of muscle mass, high blood pressure, and pulmonary function. The researchers concluded that “activity preserves physiological function.” And the findings were even more interesting – swimming between two to three miles at least three times per week could postpone aging for decades! Many longevity researchers agree that running can delay the aging process. Running comes with numerous health benefits such as weight loss, keeping the heart and lungs young and strengthening certain muscles. Running is recognized as one of the most effective age-preventers and it doesn’t even have to be intensive. You can run a few miles a day to keep your youthful side active. Studies suggest that tennis racket can help you live longer. Scientists discovered that racket sports like squash, Ping-Pong, badminton, and tennis reduce the risk of death by almost 50 percent regardless of age. The studies found out that many older adults who played racket sports benefited the most compared to those taking part in other exercises or living a sedentary life. The reason behind this new finding is that racket sports provide lateral movements, unlike many sports where you’re mostly required to move forward. Playing racket sports forces you to move both side to side and back and forth. This sharpens your organizing, planning, and decision-making skills. Likewise, in racket sports, you play against other people which enhances social interaction, a factor that’s been said to contribute to a healthier life.